PRETORIA - Power and luxury: two elements that the world’s driving elite crave. 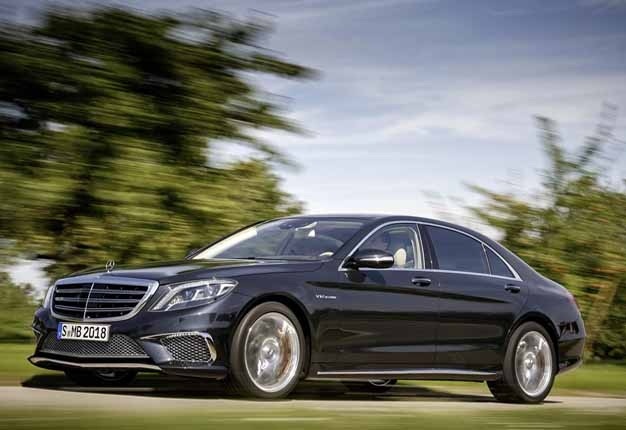 Mercedes-Benz has just the vehicles for those elite few - its new flagship S-Class models - the S600 L and S65 AMG. I had chance to drive the new S600 L and its performance sibling, the S65 AMG at launch in Johannesburg. It's evident how much these two flagship models in the S-Class range are lauded by the automaker, since January 2014, 49 000 S-Class units have been sold worldwide. Divisional manager, product and marketing for Mercedes-Benz South Africa, Selvin Govender, said: "These two models are very special to the brand and are the only V12-engined models from a German manufacturer." A touch-pad and heads-up display is now available across the range. The S65 AMG is characterised by a massive chromed grille and four tailpipes, two forged on either side. It sports massive 20" wheels with a chrome-look multi-spoke design that doesn’t look that classy. The S65 uses the M279 six-litre bi-turbo engine and produces a monstrous 463kW and has been restricted to 1000Nm - it's possible to produce 1200Nm but Mercedes claims "it's not good for the tyres". Fuel consumption is claimed at 11.9 litres/100km and its CO2 emissions are rated at 279g/km. The S65 has all the bells and whistles from the standard S-Class though benifits from AMG sport details. I was disappointed by the lack of ferocity from the V12, as it sounded distant rather than powerful and menacing like other AMGs notably the S63 and E63. An alcantara roof line makes the cabin a tad claustrophobic despite the long-wheelbase of 3.1m but sitting in the backseat gave me a glimpse of how SA's '1%' would travel to and from their homes. Nestled behind a part alcantara-and-leather steering wheel, I tugged the gunmetal paddle-shifts located behind the steering-wheel to drop down a few cogs. The S65 pairs the Speedshift plus 7G-tronic with the powerful bespoke engine. There are three selectable modes, efficiency (C), sport (S) and manual (M) can be changed by the press of a button on the centre console. I don’t think most ’65 buyers would be using efficiency mode as often and the stop/start function is available in this mode only. The shifts from the Speedshift Plus were not as rapid as I expected and took a full second before a cog would be swopped. However, when driven in Sport mode, the changes are held longer to use all the available power which results in a neck-snapping acceleration, 0-100km/h is claimed to be a startling 4.3 seconds. Interior standout features include rear entertainment and a Burmester 3D 1500 watts sound system. Mercedes showed off their Magic body control (as demonstrated by Merc using a “chicken” which Jaguar subsequently tore apart in a hilarious clip), standard on the AMG sports suspension. The S-Class debuted the technology when it was launched, by scanning the road surface with a stereo camera and then adjusts accordingly. Mercedes, feeling bullish, made us drive on the suspension track at the Gerotek proving ground. I drove it over rutted sections in both sport and comfort suspension modes. I expected to feel like I was in Orkney - a gold mining town situated in the North West- but the S-Class handled the suspension track impressively. The S600 unit is built at the same Affalterbach plant in Germany where the AMG units are built. More than 100 000 units have been built since start of production from 2013. The S600 L, the automaker's flagship model like the S65 is exclusively offered in long-wheel base form, pushes out 390kW/830Nm from its V12 bi-turbo unit and has a claimed combined fuel consumption of 11.3-litres/100km. Mercedes claims the engine is 20% more efficient that its predecessor. It uses a normal 7-G Tronic compared to the AMG Speedshift in the S65 AMG. The S600 L is the big-daddy of the range and it engulfs occupants in a swathe of leather and is proper technological tour de force. I felt like a chauffeur as I piloted it to the Gerotek testing facility outside Pretoria. We used the distronic plus with steer control on the high-speed oval at Gerotek. This function allows the car to hone in on the vehicle in front and maintained a safe following distance. The car analyses the road and keeps the car between the white lines: manufacturers like Mercedes are punting their autonomous driving features more and more as the technology becomes advanced. The heads-up display is standard on all models, the graphic is directly in front of the driver on the windscreen and is clearer than in most other cars I’ve experienced the technology in. The speed and navigation instructions are located in the graphic and in a red and white hue. After experiencing both models, I couldn’t help marvel at where the S-Class sits in the hierarchy of cars. The S65 and S600 combine Buckingham Palace type luxury with Nasa technology to create two of the most luxurious performance cars in their segment. I just wish they sounded louder. The next AMG-badged Mercedes-Benz for SA will be the new performance tuned GLA 45 AMG, set to arrive locally later in 2014.